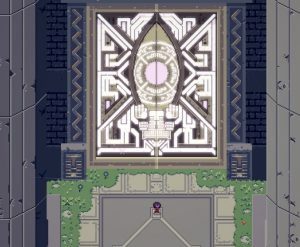 Titan Souls is the ultimate tribute to Shadow of the Colossus. Titan Souls is a blink and you’ll miss it little gem for those of us that like a unique challenge. It was just released on multiplatform Steam, PS4, and Vita. What did I think about the game? How do you beat some of the bosses in Titan Souls? 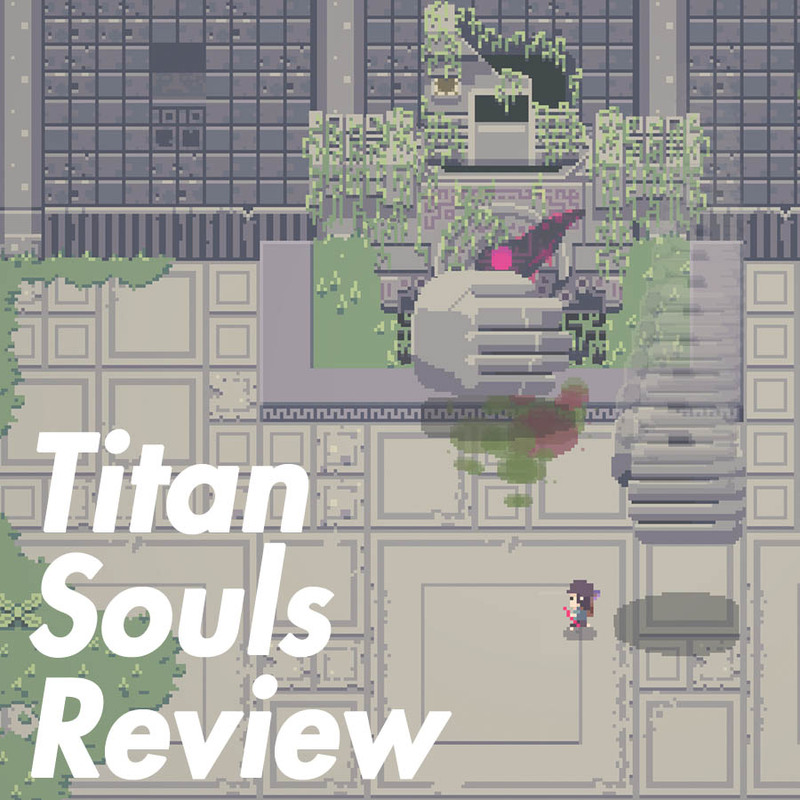 As addressed in the opener to this review/walkthrough, Titan Souls is a game that appeared with little fanfare or advertising. That being said, I expect that the game will see a lot of “Let’s Play” action on the Internet, due to the quick pace, constant dying, and short length. The goal? You explore a bleak and empty world, fighting against 16 Titans. 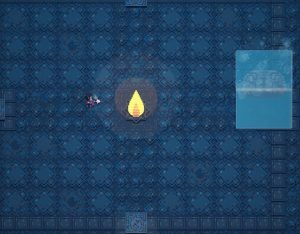 Much like the game that inspired it, Titan Souls tasks you with finding a creative way to kill each boss by striking its unique weak point. One boss may split into two every time it is hit. Another may require you to trick into killing itself. Rather than make the game needlessly complex, you use two buttons to control the whole experience. This simple concept applies to both traversal of the game’s world and combat with one of the 16 bosses that make up all of the fighting. Your only weapon is a single arrow, which is with you the entire game. Shoot the arrow and miss? You have to retrieve the arrow, either by walking over it or holding the fire button to make the arrow magically move back to your person. Along with a single, arrow, it is important to note that single hit from just about anything will kill your character. Likewise, a single blow to the weak point of a boss results in your victory. This gives the game a more old-school, quick pace. Fail, and within seconds you will be at the fight again. The game tracks your kills and deaths, making for a fun meta game among friends. Personally, I am still a fan of the bit-chip indie title with great music and unique concept. This was a mentality that started years ago and has been carried through to today. Examples of this would be Braid, Limbo, and the more recent To the Moon. Titan Souls is very minimal in its atmosphere. This is most likely due to the budget constraints on the development team. The graphics are very simple and retro. Music fits the mood of the action but is sparse and not very memorable. There is no dialogue and no real story here. You are going from place to place, killing titans and stealing their souls — in an extremely Shadow of the Colossus way — to progress. It is probably not fair to compare Shadow of the Colossus, a giant, Sony-published classic, with the work of a small independent developer, but I do want to address the differences, to avoid you from being mislead to purchase. Side note: This game is also repeatedly compared to the Demon’s Souls and Dark Souls series. I have no idea why besides the fact that “Souls” is in the title. This game couldn’t be more different than the masochistic Souls games. Shadow of the Colossus is a grand adventure and is one of my favorite games of all time. I purchased it the day it arrived in North America and fell in love almost instantly. It also housed one of my favorite stories of all time, because it let the player tell the story themselves. The goal is to save a girl who is presumably your one true love. The only way to do so is to venture through the massive world and take the souls of the 16 titans who live there. But what is initially about saving a girl’s life becomes a story about senseless killing and the selfish nature of mankind. Or at least that is how I took it. The game’s fourth boss is made to resemble a giraffe, just minding its own business in a contained forest. I actually felt bad killing the titan and realized that in order to save one girl’s life, I would have to eliminate most of the life on this new continent. Additionally, the connection between the main character “Wanderer” and his horse “Aggro” is one of the best in gaming history in my opinion. Similar to the dynamic between Robert and his dog Samantha in the book I Am Legend, Wander forms a great bond with Aggro as they only have each other. Some bosses even require teamwork. Without making this a review of Shadow of the Colossus (I fear it has already been derailed), I have to say that none of this is carried over into Titan Souls. The world is far smaller than the one in Shadow of the Colossus and feels more like a hub for bosses than anything else. There is no story to compel you to kill the titans (nor should there have to be). The game is also much shorter and there is no real consequence to finishing the game, and it just sort of ends with credits. I want to again stress that this is totally fine. I frankly miss games that are just about playing a game and nothing else. But the game keeps getting compared to Shadow of the Colossus, since it was definitely the biggest source of inspiration in creating Titan Souls. Just think of Titan Souls as a “tribute” to Shadow of the Colossus with a gameplay system and style all its own. A lot has also been discussed about the difficulty of Titan Souls. The game is a weird balance between frustratingly difficult and super forgiving. You might lose to a titan a handful of times, but you can easily step right back into the battle and fight the boss multiple times within a minute. The game, even on your first play-through, will only take a couple of hours, unless you spend time exploring the world for absolutely no reason. There are a couple of secret bosses, but I only discovered them through YouTube videos and one is laughably simple, though a unique idea. I think the game would have gained an even bigger audience by requiring the player to beat the entire game without dying once. It would have put the game squarely in the echelon of rewardingly difficult games as opposed to somewhere in the middle. This is an option once you have beaten the game, but I think it would have made more sense to force the player to do this from the beginning and perhaps slightly tone down the difficulty of some of the bosses (I’m looking at you, Final Boss). I understand tuning the difficulty for mainstream appeal. Hell, I wouldn’t be reviewing this game right now if you had to beat it in one go, one life. But then the game wouldn’t be made for me. If the Dark Souls series has taught us one thing, there is a large market hungry for excruciating difficulty. Titan Souls was a game I had a lot of fun with for what it was. The boss mechanics were unique enough, and the style was charming. For $15, Titan Souls feels like the perfect equivalent to seeing a movie on a Friday night. Get the game, marathon it for a couple of hours, and have a good time. Just don’t expect the next epic title that will be talked about for years following. 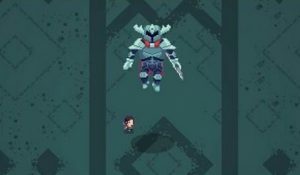 Here are some tips and strategies on how to beat the bosses in Titan Souls. Note: I am not even going to pretend to know the names of these bosses, so I’m naming them by the way they look. The green blob is the boss on your left when you start the game, so I am going to wager to say he (she?) is the first boss you are supposed to tackle. The green blob is the most “standard” boss fight in the entire game. If you have ever played a video game before, you will know what to do here. Shoot the blob with the heart inside of it until it is separated and flopping around. Shoot the heart to kill the boss. Try running in large circles around the whole map. I found this did a good job of separating the heart blob from the pack. Avoid the slime trails left by the blobs as they slow you down considerably. When possible, manually retrieve the arrow from the ground. Holding the arrow button to draw it to you after firing, doubles the chances of hitting other blobs and making them split into smaller, faster blobs. The trick with the sliding ice cube is to fire an arrow through the torch in the middle of the stage and directly into the boss. This will be enough to thaw the ice so that you can kill him. The trouble is that the only way to reveal the torch is if the boss hits a switch on one of the sides of the room. Stand near the middle of the room. When the boss slides at you, position yourself between him and a switch. When he slides, roll out of the way and then roll to position yourself behind the torch facing his assumed position. Ready the arrow and release as soon as the torch shows up. This is truly the only boss that I am sort of at a loss with. I got lucky, running in circles from the start and luckily shooting him. The boss moves four times and then fires the laser. Once you find a pattern that works, run around the boss in circles until you are in position to fire again. To find a movement pattern that works, move sporadically around the map while maintaining distance. DON’T hold the button for your arrow. Always retrieve it manually. This is probably the easiest boss in the game, once you know his strategy. The battle starts with the boss protecting his magic weak point with one of his hand while lifting the other to attack. Once he has attacked, he will move the covering hand to attack and move the previously attacking hand to defend the weak spot. As soon as the boss removes the other hand to attack, the weak point is exposed. Release the arrow. The Yeti Boss in Titan Souls is also a simple boss battle once you figure out the best pattern. The Yeti repeats a pattern of throw four snowballs and then roll at you three times. What you might not notice in the chaos is that the third time, the Yeti rolls — before he throws snowballs — he waits a bit longer. This is your window. Before the boss rolls at you a third time, try to be near a wall. Take a split second, aim, and fire. This boss is an interesting beast. There are two elements — A constantly rising and falling face that blows you away and towers that follow you from underground and shoot a row of icicles. If you are looking for help here, you may have already figured out that you need to trick the tower into shooting the row of ice at the face’s row of teeth. Doing so causes one of the teeth to disappear. Here is what you want to know: NO, you do NOT have to remove all of the teeth to win. All I did was remove one tooth and then aim for the revealed weak spot. The underwater snake is a complete ripoff of a Shadow of the Colossus design. This has nothing to do with the battle, but I just wanted to get it off my chest. Anyway, the water snake has two attacks that I am aware of. It jumps in the area and destroys the platform you are standing on and completely electrocutes the water. You should be able to kill the boss before it electrocutes water. Note: The weak point for the boss is NOT the yellow gem on its head. It is instead a purple thing on the end of its tail. Stand on an icicle that is relatively close to another ice platform. When the snake starts to ascend to jump and destroy your platform, get in the water and mash the roll button to swim to the adjacent platform. As the boss destroys the platform, ready your arrow and fire as the purple piece is at your level (around where the ice platform used to be). The tentacle plant is one of the most overwhelming bosses if not managed properly. There is crap happening everywhere with this one. Start the battle at the bottom of the screen (south). Run back and forth, hugging the southern wall. Roll through the gas cloud. It DOES not kill you immediately. As the weird mouth thing of the plant rotates to the face you here, run towards it. As it starts the sucking animation fire the arrow in the mouth. Run away from the gas cloud and hold the arrow button to open up the portal. If you mess this up, just kill yourself. Honestly. The jumping mushroom boss is one of the simpler concepts. Roll out of the way as the boss gets close and dodge the gas balls. You can touch the trails, but they make you go all “Touch Fuzzy, Get Dizzy” (+1 gamer point if you get that reference without Google). The weak point is obvious. There is a giant pink protrusion on one side of the jumping mushroom. Here’s the tip: Everytime the mushroom jumps, it turns a bit clockwise. Line up your shot with the expectation that the weakpoint is coming at you clockwise and the battle becomes a LOT easier. Okay, I know the name of this boss. It tells you how cool he is every time you retry this fu—– sorry, I hate this guy. As the beginning of the battle implies, the goal is to shoot the giant magic arrow flinging itself around the stage. Once the arrow is hit, the boss (and you) become vulnerable. 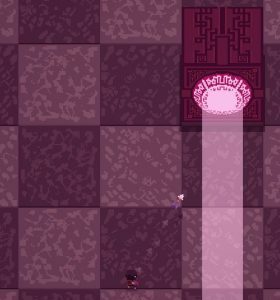 You will have practically no time to retrieve your arrow and shoot the boss before it gains its defenses again. The trick is to maintain close proximity to the boss and the arrow. Dodge the arrows as the boss fires them (listen for the sound cue and roll). When the magic arrow comes near fire a quick shot. This will get you very close to the boss. Simply step over your arrow, aim, and fire. Half the battle with this boss is getting there. I just shot a bunch of random stuff until a trapdoor opened on the bottom right of the first room you enter (the one with the gold). The Mimic itself is super easy (or it was for me). The boss throws gold. Avoid it. After throwing coins and giving chase the boss will get on it’s face and jump at you. It will do this TWICE. Run away and as the second jump finishes, turn around and face the boss. Ready that arrow. When the boss opens its mouth and sticks out the tongue, fire. This boss is interesting he seems to charge you endlessly with his mace hands until you fire and arrow at him, which makes him start spinning in circles, with the mace hands closer to his body. But the skull also spins, revealing the pink weak spot at his back, which you can aim and fire at. You need to keep your distance here and then fire a good shot when his back is in sight. Otherwise, he will always be facing you. I suppose you can fire an arrow and guide it to his back from behind. But there is a lot that gets in the way in this battle, making that tough. Other than the strategy of shooting him to make him spin, there isn’t much else to do except dodge a lot. Have you ever played Super Mario Galaxy 2? The lava boulder boss is like any of the boulders with a weak point in that game. This is among the easier bosses. Run to one side of the stage, ready the bow, and let the boss roll towards you. When the weak spot is in sight, fire away. The boss is done. The Lava Blob boss was one of my favorites in the game. I like it because the strategy can be discovered fairly simply, but requires good execution to win. In case you didn’t figure out the strategy, you need to guide the boss into one of the explosives he fires out of his mouth. To do this, you need to let him inhale your arrow and drag him over one of the bombs he spits out. This reveals the core diamond inside of its body, which you can shoot to win the battle. Immediately after the lava blob spits fire the first time, run right up near the boss’s face. The blob will inhale the air, fire your arrow in his mouth. Stay very close to the boss as he spits out the bomb to keep it close. The boss will jump left and right (that’s his pattern). Keep that in mind as you drag him towards the bomb without getting directly behind it so the flames do not accidentally destroy the bomb. Remember the easy stone golem boss from earlier with the two moving hands? Imagine if he sucked and you get the “Laser Firing Stone Hands Boss”™. To beat him, you have to have both hands holding down two switches on either side of the room. This reveals the weak point in the center. From there, you just have to watch the lasers that are constantly being fired and line up a good shot. The hands try to smash you twice. Run to the left but not on top of the switch. Roll away from the first attack, position yourself on the switch, and then roll off the switch on the second attack, rolling towards the right platform. Repeat for the right hand. Fire at the weak point. Ah the final boss. The hardest one and my least favorite. To kill this boss, you need to shoot the person that sometimes appears in the boss’s place. I did not find a tried and true method to do this, but I found that shooting at the boss makes the transformation occur more frequently. Absorbing your arrow back to you absorbs the boss’s arrow to you as well, which will kill you. Keep your distance. Shoot at the boss in a place where you can easily draw the arrow back before the boss absorbs it.